In spirit and truth. If I want to worship as a true worshiper, I must worship him in spirit and in truth. But what does that mean in practical terms? This can be a very extensive topic, but I just want to focus on the large picture. In each age, the Lord wants his people to worship Him in SPIRIT and in TRUTH. The spirit is distinguished in scripture from our flesh (our outward tent) and from who we are (our soul). Adam, for example was created from dust (flesh). He became a "living soul" when the breath of life (the spirit which originated with God) was breathed into him. Taking a step back, that means that a soul can be "not living." Scripture tells us, "the soul that sins, it [he] shall die." We'll have to leave that there and cover it in a separate post. So to worship in Spirit, we must do it from that which is created as a direct creation by God. In this sense angles are called "spirits." That is, we cannot worship him in the flesh. Self-flagellation, penance, etc. these are works of the flesh and God has no use for them as forms of worship. We must walk in the "new man." We are born into a decaying tent with a fallen nature. In Christ we have a new nature and we are a new creation. We must come into the light, walk worthy of our new calling and walk according to the spirit (Ephesians). Worshiping in spirit may seem at first glance the more complicated of the two requirements, but I believe it is worshiping in truth that seems to elude us in this age. There are some obvious things about worshiping in truth that I am not going to address. We must know who God is. We must know what he's done for us. We must know and obey the gospel of the free grace of God. But often in our day we see things that look like truth, sound like truth, have language that appears as truth... but the worship is rejected by God as not according to truth. Look at Aaron and the Israelites here in Exodus 32. 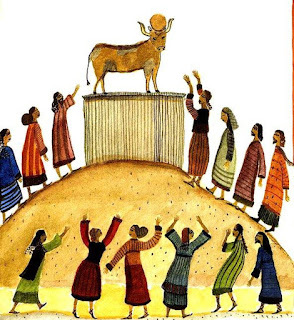 Here, a redeemed people, with a chosen leader, want to worship Elohim and YHWH (Jehovah). They have the right names. They proclaim correctly what he did (brought them out of the land of Egypt). They even built an altar. We immediately see that much of their activity is done in the flesh (engraving, molding, eating, drinking, playing) and not in the spirit. 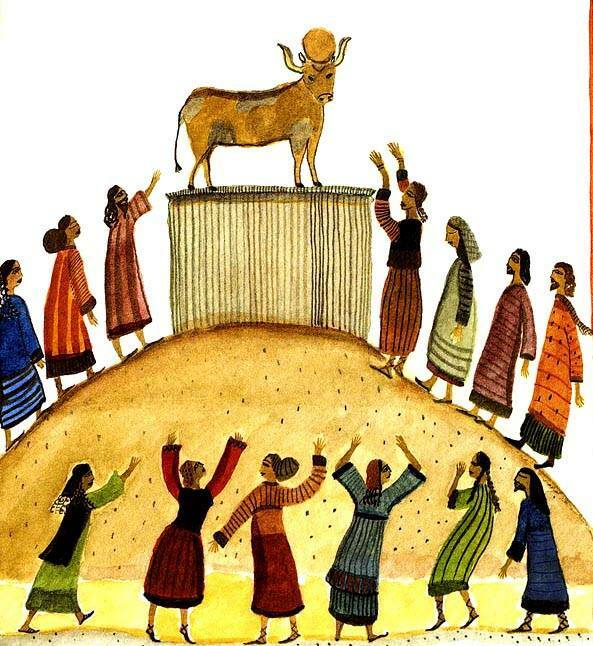 It appears "religious" (a golden calf), but God is not impressed with man's religion, he wants truth. They sacrificed, they engraved, they molded... all in the name of the true God. But he never asked them to do any of those things. In our day, many do things in the name of the true God, but not according to his instruction. They may even follow patterns in scripture, but many of these patterns were never given to them. We don't sacrifice sheep despite the commands along those lines. We don't circumcise. We don't follow Sabbaths (plural). We don't got to the Temple, etc. To do these things would be to try and worship according to another's truth. So there is truth that is stated as always true (e.g. God is one) and there are truths that are particular to one group but not another (e.g. Passover). We must worship according to everlasting truths and according to the truths given to us. It may be beautiful. It may be religious. It may stir feelings of worship. It may use the right names and attributes of God. It may even be found in the pages of scripture, but if it is not in line with both everlasting truth and particular truth, it is not worship. Hindus may worship. Muslims may worship. Animists may worship. Professed religious Christians may worship. But all these deny eternal truths about God and his one way to resurrection life. Even some Christians who may understand the eternal truths, try to worship God according to practices not given to them. All of scripture is FOR us, but not all scripture is TO us. So if you come across a command to build an ark, don't feel obligated. Truth is independent of time ("it's an ancient practice! "), independent of man's authority ("the church teaches it! "), independent of numbers ("millions worship this way!") and independent of anyone's opinion ("it works for me!"). None of these arguments will make something into truth. For true worship we must have a new nature (given as a free gift by God), we must be walking in that new nature, we must know eternal truth and we must practice truths particular to us. We are imperfect beings (and God knows we are but dust), but to truly worship him, we must seek to follow these guidelines as closely as possible in these bodies of death. Let us worship in our new nature (in spirit) and in the way he has prescribed for us in the age in which we live.